Our early wake up time was rough. 7am and we were already on the road with stomach churning hangovers. 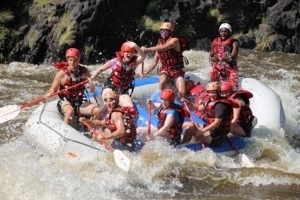 Today we were white water rafting down the infamous Zambezi River. During this time of year, the water levels are high in the river. This means the rapids are a little less intense; I was probably the only one happy to hear this. 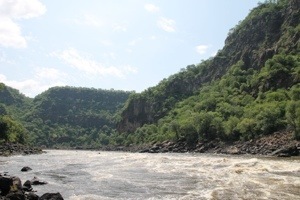 The Zambezi river has world class rapids. They are intense at high water and absolutely insane during the low water season. Having only been white water rafting in very low grade rapids, I wasn’t quite sure what to expect with grades 4 and 5… I was a little nervous. It was a half hour or so drive to the starting point. Then we had to climb for twenty minutes to the bottom of the gorge. There were enough of us on the tour to fill 4 rafts with 7 people. Our boat held Kelsi and I, Robbo and Emily, Sandy and Nick, and Kate. The perfect crew. Our guide was a young, fit, Zimbabwean guy with a great sense of humour. 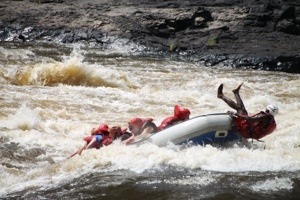 Robbo took two steps towards the front of the raft, slipped on a rock, and went splashing into the river. Good start. Nick grabbed him by the life jacket (as was described in our safety lecture), dunked him in the water then yanked him up towards the raft. Robbo managed an odd, armless, salmon-like wriggle onto the boat that left us in fits of laughter before the trip had even begun. They were right, we were going to have a great time. So we went through the process one at a time. “Forward!” and we rowed. “Left!” And we turned. “Get down” and we ducked inside. “Forward again!” So we jumped back up and started paddling. “Get down” we fell back down into the bottom of the raft… All of us except for Nick. 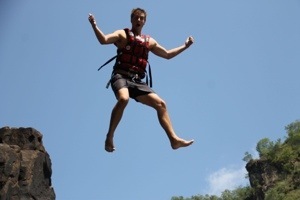 Nick was so excited about the “jump out” part, that he just ejected himself from the boat and hurled himself into the river. Way to listen buddy. When the guide saw him he just shrugged, “okay, jump out!” He took his paddle, swung it around and nailed me in the chest, knocking me backwards into the river as everyone else threw themselves from the raft. We ended up, once again, in stitches laughing. When our failed practice was over, we headed for the first rapid. White water shot up in front of us in waves and whirlpools as we floated towards it. “Forward! Forward!” We could hear our guide yelling at us “Faster!!! Okay stop!” We pulled our paddles back and crashed our way up and down through the first rapid. Our raft tipped, and fell back against the wave, until we came safely out the other side. Success! 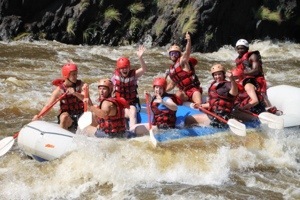 All my fears and worries about rafting melted away. This was too much fun already! 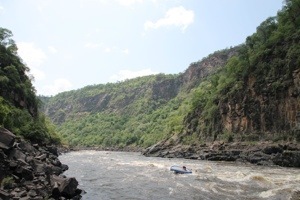 After a couple more similar rapids we pulled over on the side of the river to do some cliff jumping. Everyone got off the rafts, climbed up the rocks and leapt into the river as the guides filmed and took photos from below. 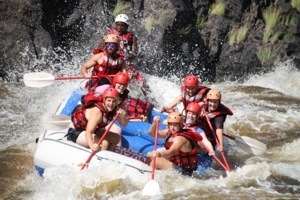 We had a great time watching everyone fling themselves from the rocks, life jackets still on, and into the water below. 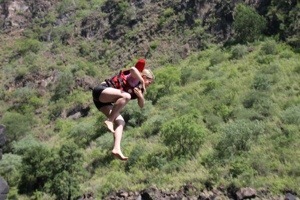 When it was Emily’s turn to jump, she thought the guide had said to curl into a ball when she jumped. So she took a step forward, jumped, wrapped herself into a cannonball, started shifting forward and landed with a splash…face first. Although I’m sure the landing hurt like hell, we couldn’t help bursting into another laughing fit when we found out she was ok. When all of us had a turn, it was back in the boats and time to move along. We had been trying to convince our guide to purposely flip our boat in the middle of a rapid since the beginning of the trip. It wasn’t going to be that great of a story if we all stayed afloat the whole time. Unfortunately, he said that he wasn’t allowed to do that; so instead, we threatened to sabotage the raft ourselves, all jumping to one side as we crashed over a wave. I’m sure he thought we were crazy. 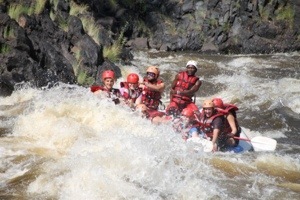 The next rapids we were going through were three different ones in quick succession. 15, 16a and 16b (also called The Terminator). Our guide explained briefly how we were going to go through it and what to do if we fell out. “Please.” He said “do NOT fall out on these rapids. If you fall out at 15, then you have an excruciatingly long trip before we can pick you up. 16b is a grade 5 rapid. You really don’t want to have to swim your way through that. But if for some reason that happens, float down the middle. There are too many shallow rocks and whirlpools at the edge of the river.” Ok, we agreed. No flipping on this one. So we watched the first raft go through before us. The team paddled and rose against a rapid, then crashed down out of sight, then back up again on the other side. The edge of their raft came up alongside another wave and the whole boat began tipping to the left. Paddles began to fly, people leaned in various directions, trying to counteract the movement, and then the entire raft flipped, as if in slow motion, on top of them all. Oh my god. This was going to be good. with both arms “HECTOOOOOOR!! !” He roared in battle cry. Sandy managed to take a seat at the back of the boat “Everybody up! FORWARD!” We all jumped up and started to row. Our guide was now long gone from the boat. We had commandeered the raft and were taking charge. “FORWARD! FASTER! TO THE LEFT!” We heard Sandy shouting commands as we hurled along into the final, grade 5 “Terminator” rapid. We were at full force adrenaline by this point. All of us were yelling and shouting in incomprehensible excitement. It was chaotic. “GO!” “GO!” “TOGETHER!” This was our raft now, and we were going to take it all the way to the end of the Terminator. Despite our best efforts, we kept floating off to the right side of the river. In front of us were a bunch of jagged rocks, sticking up out of the river, behind us we could hear the muffled yelling of a man in a kayak trying to catch up with our raft. With Sandy’s guiding skills we just barely missed the rocks. As we passed them, the kayak caught up to us, and we pulled the man, kayak and all, into the raft with us. He took command for the last few seconds of the rapids, and when we all came out into the calm river on the other side, we were back into breathless laughter again. 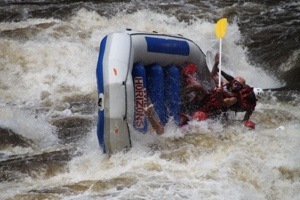 Turns out we were the ONLY boat that didn’t flip during the set of rapids; and we did it without a guide! Another raft had picked up our guide somewhere downriver and he was laughing just as hard when he was safely returned to the boat. 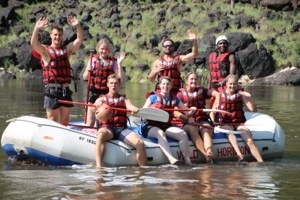 When we all got back in, we paddle high-fived at a successful rapid completion! 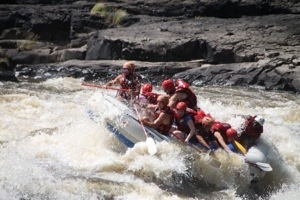 Our adrenaline was still pumping as we continued down the river. The next rapids were fun, but nothing compared to what we’d just been through. So we rounded a couple more bends with ease, then pulled over on the side of the river to let all the rafts catch up. “Okay guys, the next one is a big one” our guide warned. “It’s just one big wave we’ve got to go through. At low water this wave is over 18 feet high. Are you guys ready?” We had no choice really, so we started to paddle. You could see the wave growing as we came towards it. It was huge, looming above us as if to say “go ahead, try it”. “FORWARD!! PADDLE! GO, GO, GO!” Our guide screeched as we came closer. The wave now towered over us. White water spraying in all directions over us. We dipped down right before we hit it, then came vaulting up against it with surprising speed. We paddled as hard as we could, pushing the boat more and more vertical as we climbed the wave. 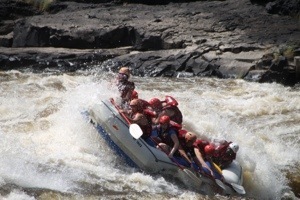 The guide was still screaming from behind us, but his voice was drowned from the sounds of the rapid. Our boat climbed into a fully vertical position then seemed to freeze. In my mind, it was all slow motion. The boat shifted to the left and I could see everyone in the right side of the boat falling towards me. I saw water, then land, then water, then the raft, then everything was dark and silent. I was spinning under water and had at some point lost my paddle. I wasn’t sure which way was up, so I just stayed still and hoped I would come back up to the surface. When I came up I was spewing water from my nose and mouth. Everything was dark, and I kept slamming my head into something hard. It took me a moment to realize that I was under the raft. A wave pushed the boat up for a moment and light came pouring in for just a second before crashing back down into darkness. I pushed myself back down into the water and tried to come out from beneath the boat. I came back to the surface choking on water. I could see the raft, upside down in the river. Our guide was standing on top if it dancing. He was laughing and pointing at us as he jumped around! “Who fell off now! ?” He taunted in giddy excitement. I was still coughing up water when Sandy yelled at me to grab his hand. He pulled me towards the raft so I could hold on. Then I turned around to see Nick holding out his paddle, trying to get back to safety as well. I grabbed his paddle and dragged him back to the boat. The three of us and the guide managed to flip the raft upright again and we all climbed in. I had no idea where Kelsi was. Actually, I didn’t know where anyone else was. 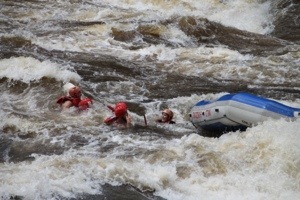 We were still crashing through the rapids when we saw four life jackets bobbing down river a little ways. A man in a kayak was with them, yelling some sort of commands. When we caught up to them, they were all tangled together. Kelsi’s paddle was locked in Kate’s life jacket. They were holding hands, and they were killing themselves laughing. I leaned over and grabbed Kelsi by the life jacket. So I dragged her and the two paddles, very un gracefully, into the boat and we crashed onto each other giggling. “My paddle!! !” I was so excited it wasn’t lost. We were all safely returned to the raft, and now no longer had a leg to stand on when it came to teasing our guide about falling out. We were happy though; our raft had flipped just like we’d wanted! The final few rapids were easy. We cruised through them, rowing here and turning there. We clung onto some of the other boats and sprayed water at each other teasingly. Then finally it was time to pull over and climb out. What a trip! Not much was left to do… Except for climb out if the gorge! Climbing out of the gorge is like climbing up a 40 story building. It didn’t help that it was now midday and the heat was deathly hot. I didn’t realize how out of shape I was until three quarters of the way up the hill. I was faint and out of breath and drenched in sweat by the time I reached the top. Luckily, icy cold water and beer was waiting for us along with a huge lunch! We recovered, and hydrated, and filled ourselves to the brim, then hopped back in the truck to head to camp. Our hangovers were completely nonexistent. What a morning. Up next: the gorge swing! 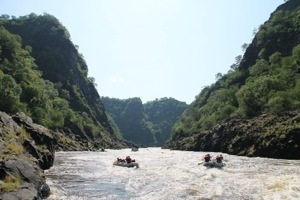 This entry was posted in Africa, Zimbabwe and tagged Travel, Victoria Falls, White water rafting, Zambezi river, Zimbabwe by hilarylust. Bookmark the permalink.